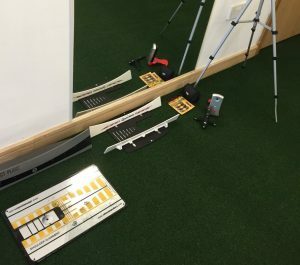 All lessons include Trackman technology of all swing and ball data including high speed camera footage, HD report with audio and footage of the session highlighting development points. Ideal if you and a friend or relative wish to share a lesson together. Camera analysis with email of faults and fixes with relevant drills and before and after comparisons. 9 holes on Championship Machynys GC. During this session we will look at technical aspects but mainly this is a tactical and mental session looking at how to maximise your scoring. 18 holes on Championship Machynys GC. During this session we will look at technical aspects but mainly this is a tactical and mental session looking at how to maximise your scoring. Report of session and main focus points including videos. This session is more than your average putting session. We will look at perception points (where you see a straight line) then using lasers we will look at face alignment and face delivery using high speed camera use. Get all your yardages ready for the season take away any guess work by getting deadly accurate data on club yardages.. Lessons include video analysis and feedback of session given via email. Book a course of 6 individual ½ hour lessons and receive 1 session free of charge.